Sister Editors – The Bookshelf of Emily J. 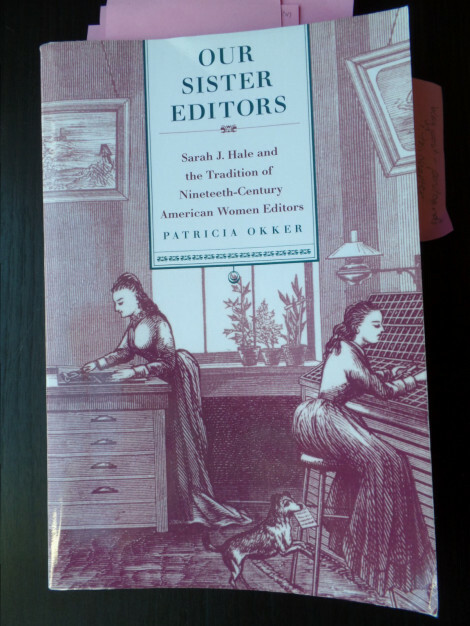 This academic study called Our Sister Editors: Sarah J. Hale and the Tradition of Nineteenth-Century American Women Editors (1995) contains historical, cultural, composition, literacy, and rhetorical elements of the nineteenth century. Patricia Okker’s research in this book gave me insight into how to approach research on a periodical that was published in Utah from 1872 to 1914 called the Woman’s Exponent and on other LDS women’s archival materials. I have so far written three papers on these topics, including a study of the Woman’s Exponent as a representative form of professional communication and religion, a paper about the Halifax, England, women’s Relief Society during WWI, and most recently, a paper about the organization of what LDS women called Mothers’ Work from 1903 to 1909. I will present that paper at a conference in June. The first chapter of Okker’s book is most useful as a cultural study because it overviews the climate of women’s editorships during that time. She backgrounds her own specific study of Sarah J. Hale that takes up most of the following chapters. We learn that separatist rhetorics is a term used to describe and “emphasize that ‘separate spheres’ constituted neither a monolithic ideology nor necessarily any reflection of ‘reality’” (p. 14). She asks why the rhetoric of separate spheres appeared so often in magazines of the time and why they “appealed to so many women editors” (p. 15). Were they empowering to somebody? Okker uses Estelle B. Freedman’s work to explain the importance of women’s periodicals of the time. Freedman called them “female institution building” and said that “public organizations and institutions created by American women in the late nineteenth and early twentieth centuries—specifically women’s clubs, women’s colleges, and actual buildings such as the Woman’s Pavilion at the 1876 Centennial Exposition in Philadelphia and the Woman’s Building at the 1893 World Columbian Exposition in Chicago—encouraged women’s increased status in society without abandoning the supportive networks of women’s culture” (p. 21). I see connections here to some of the other research I’ve done, specifically to Anna Eliot Ticknor’s correspondence school and Josephine Cochran’s dishwasher. We see from Okker’s study that “women-identified periodicals provided an opportunity for like-minded women to come together in a public forum” (p. 21). We also learn about editorial voice, which Okker calls “the sisterly editorial voice” which “often used the rhetoric of intimate female relations . . . [and] assumed equal and personal relationship between editor and reader” (p. 23). This voice is present in many other periodicals and writings of all ages, including in Elizabeth Tebeaux’s work on women’s technical writing in the English Renaissance. This identification and connectivity of women writers with their readers has been oft explored in the field of professional communication. In addition to this editorial voice that crossed spacial and intimate boundaries, Okker identified “diverse contents [and] different voices” (p. 33). Readers and writers submitted materials to the magazines and “direct communications between readers and editors reveal the magazine’s dialogic nature” (p. 33). Okker argued that this created a public female space that had power (p. 166). She claimed that Hale’s “editorial columns consistently reveal both the power of the sisterly editorial voice and the flexibility of Victorian ideologies of the separate spheres” (p. 166). We learn that “in the same way that this sister editor found her own voice of authority within the public and separatist world of women’s’ periodicals, she also constructed her own magazines in order to extend that power to her readers” (p. 166). Most of the study focuses specifically on Hale as an editress, and one section focuses on how her work led to “success in creating an identity for herself” (p. 57). Much of the purpose of women’s periodicals was to create or learn identity for the writers and the readers. They also focused on improving women’s “sphere.” Interestingly, Hale lived through and demonstrated a shift from Enlightenment philosophy about women and men, that they had equal intellectual capabilities. She later accepted the Victorian philosophy, called an essentialist theory, that suggested women and men had natural differences, including that women were more moral and virtuous and men were more intellectually capable. Domestic work was important to women at this time, and Hale is often credited with “coining the term domestic science . . . [and] repeatedly argued that housekeeping was worthy of serious study” (p. 61). Hale “placed significant artistic value on women’s domestic work” (p. 61). She also “celebrated the idea of a separate women’s culture” (p. 60). The term itself, domestic science, according to Okker, was used “to undercut an assumed dichotomy between private domesticity and public professionalism” and “Hale used domestic imagery when discussion women’s professional careers” (p. 74). She did not use male definitions to describe or identify herself, and “her vision of women’s professionalism focused more on what women could do for society than on what jobs paid well” (p. 75). I see a connection to Leavitt’s work on domestic advisers of the nineteenth century. The appendix of the book has a list of nineteenth-century American women periodical editors, including some of whom I’m familiar with through the Woman’s Exponent, like Lula L. Greene Richards and Emmeline B. Wells. There are other LDS women included as well. I previously posted about this book’s list of types of female readers. You can see that here. Especially in modern times where feminism is a rage, it is nice to read old literature and see how women have evolved. I have never really pondered on who coined the term domestic science etc. I am sure this must have been a very informative read. It was a very nice read. I love reading about the histories that inform the way women enact identities now. Nine teeth for that century, huh? Sounds like a fascinating study. 🙂 Apparently there were no dentists!